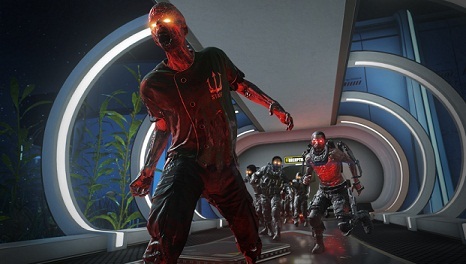 The CoD - Advanced Warfare offers Reckoning DLC, the last part of the popular Exo-zombies mode. We show you all available weapons so you can prepare properly for the final zombie battle. Call of Duty - Advanced Warfare - Reckoning brings you the final of the Exo-zombies saga, a panel of four major co-op maps story campaign, in which concerns triggered by biological weapons zombie plague. The whole zombie story takes place in an alternate reality of the Call of Duty universe and covers a total of four maps. There you will find some weapons in 3D printers, one of which to spit some unchanging shoots. The first map of Exo-zombies saga called Outbreak and place in a secret Atlas Research Base, in which the zombie plague has broken out. Your characters have to fight with the following weapons to survive. The Map Infection is the second chapter of the Exo-zombies story and set in a typical zombie movie cliché, a shopping mall. There are of course also plenty of shoots around in different stores that we want to show you in the following table. The Arsenal on Carrier is the third map and the penultimate chapter of the Exo-zombies story. This time it has drifted to a high-tech aircraft carrier, the survivors, on the course, the zombie plague has broken out. Ordinary 3D printers spit out one of the following weapons randomly for 1,000 credits.